Is Your Cast Iron Properly Seasoned? Is Your Cast Iron Seasoned Properly? This article was shared by Mom's Pantry friend Julie Miklas, who owned a retail outlet for cast iron cookware. We appreciate her sharing her expertise with us. The biggest complaint I hear from folks who are new to cooking with cast iron is that whatever they're cooking is sticking to their cast iron. If food is sticking to cast iron it's either being cooked at too high a temperature or it's not seasoned properly. Oftentimes, it's a combination of the two. When cooking with cast iron, you MUST cook at lower temperatures than when using aluminum or other types of cookware. In addition, cast iron retains its heat so well that once the iron is thoroughly heated, you'll most likely need to lower your temperature even more. Most home cooks are not used to cooking at such low temperatures. I know that that’s been my own biggest problem when cooking with cast iron. New cast iron is typically a battleship gray color and has a coating of paraffin wax. That wax coating is to protect the cast iron from rusting during shipping. The first thing you have to do is to either melt the wax off (in the oven or grill) or use very hot water, soap and a wire brush and scrub it off (I don't recommend the hot water/soap option, because I was NOT able to get the wax off very well and frankly, I didn't want to have to put THAT much time and effort into it!). If you choose to melt the wax off, you're best off doing that outside as it is a smoky process and gives off a lot of odor, which you don't necessary want inside the house. The following image is of a brand new waffle iron with the wax coating still on it. Next is an image of a cast iron waffle iron that was returned to my store because the customer had problems with the waffles sticking. As is readily apparent, this waffle iron was not seasoned properly and there are areas of the cast that never even saw any oil. If you have cast iron that food is sticking to and it looks like this, you need to work on properly seasoning your cast iron. If you have an improper seasoning, such as the one in the above image, your food is going to stick. There are no ifs, ands or buts, it WILL stick. 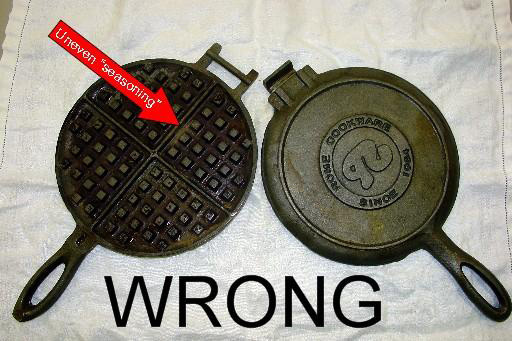 It's obvious from the above picture that the person didn't even attempt to season the waffle iron properly. Whatever oil was used was not applied evenly, and was not allowed to "bake" into the iron. It's no wonder this person was unhappy with the waffle iron! If your cast iron looks like the piece above, you're going to have to completely strip the seasoning and start all over. The easiest way to do that is to place your cast iron in a self-cleaning oven on the cleaning cycle. 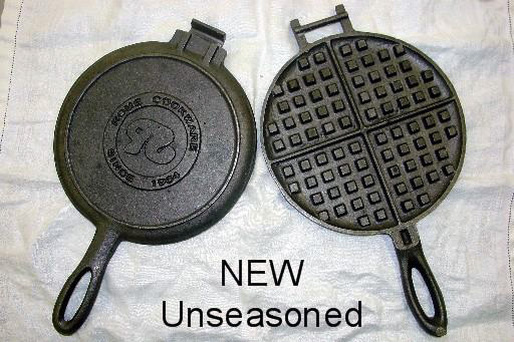 That will completely strip any seasoning from your cast iron and will return it to it's battleship grey color. 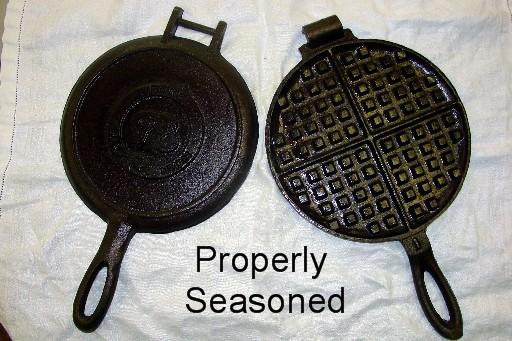 The waffle iron in the last picture went through the seasoning process FOUR times. You'll notice that the seasoning is very even and very shiny. This waffle iron is now completely non-stick and will make the best waffles you've ever had! There's no "secret" to seasoning your cast iron. It just takes time and a willingness to do it properly. Any cast iron that has been properly seasoned will be completely non-stick and best of all, super easy to clean!